While Minnesotans are bundling up to get out of the coldest temperatures we’ve seen in decades, it’s important to remember to keep our pets safe and warm, too. The American Society for the Prevention of Cruelty to Animals says winter’s dry, cold air isn’t just uncomfortable and potentially dangerous for humans, but also four our furry companions. Our pets rely on us to keep them out of dangerous weather, so to help prevent injury and suffering, the ASPCA offers some tips. After exposure to the outdoors, the ASPCA says you should wipe your pet’s feet, removing snow, ice and chemicals from its pads and in between toes — even better if you’re able to massage petroleum jelly or other paw protectants on their feet, or have booties that will provide more coverage. And speaking of booties, sweaters, jackets and neck warmers are all good options to protect them from the cold. They might be angry at first, but let’s face it, they’ll thank you later. Additionally, the animal organization says to remember to thoroughly clean any chemical spills from your car like coolant or anitfreeze because these are lethal poisons for your pets. Because pets burn extra energy trying to stay warm in the winter, it’s also essential they’re being fed enough. By feeding them a little more in winter months, you’re providing them with much-needed calories, and enough water to help with dry, itchy skin. Lastly, the best way to make sure your pets stay safe and warm is to keep them indoors as much as possible. 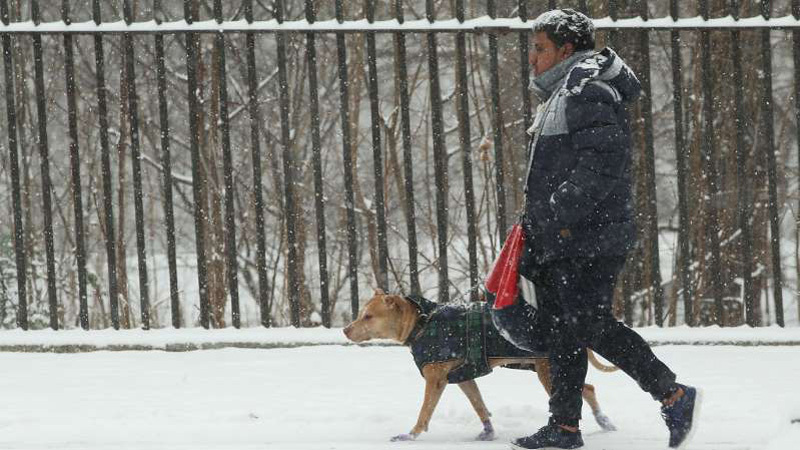 The ASPCA reminds us, if it’s too cold for us, it’s probably too cold for our pets. This also applies to leaving pets in a car, that if left improperly heated, could be fatal. If your dog is going stir crazy being indoors, check out indoor daycare in your area. For example, Downtown Dogs in Minneapolis offers a 15,000-square-foot facility where dogs can socialize with other dogs and get some exercise. You can drop your dog off just for the day, or board them overnight. Hourly rates and day rates apply.